A special cabinet meeting has been scheduled for today (October 31) to conduct a performance review of all ministries, divisions and departments. In this context, I am offering some reflections from my tenure as federal minister in the interim government last year. These reflections relate to the systemic constraints, which in my opinion, stand in the way of effective governance and hence hamper the government’s performance. The frame of reference is government ministries and the issues highlighted are of a long-standing systemic nature. First, an objective assessment of performance is possible only when goals, time-bound outcome-based targets, and performance metrics have been pre-defined. None of these is the norm in ministries. Government functionaries usually do not have a clear sense of delivery with no clear terms of reference and measurable operational targets in the context of overall goals for a sector. Hence as a starting point, these need to be framed. My second observation relates to expectations regarding the government’s performance, which matters deeply since it determines the context in which all societal actors operate. Paradoxically, I noted that governments here were simply not set up to perform. In setting up and running the government, the focus is on all attributes – elections, installing leadership, cabinet selection, and key appointments – except those that matter for its performance. As a result, the government’s wide-ranging strategic functions, which could provide a scaffold for national progress and development, are compromised. In this regard, I found two key features missing from the performance equation – incentives and accountability. Lack of appropriate incentives leads to underperformance. Rigidity of compensation is one aspect but perverse incentives, illustrated for example in the tendency to reward bureaucrats for furthering political allegiances, are more damaging. Additionally, there are serious gaps in performance and decision-making accountability. Functionaries are simply not answerable for performance. As a result, policies have limited grounding in evidence, priorities are determined by political expediency, the policy-action disconnects remain unaccounted and unnecessary policy vacillations, detrimental for reform, go unchecked. Many upright government functionaries of integrity navigate this space with great difficulty. The system just does not empower them to take control fully. On the other hand, corruption, collusion and arbitrage have become deeply entrenched. In many cases these have become the system itself. Many government departments extract rents and distribute them according to well-established shadow ‘rules’, which now govern the de facto functioning of departments. These performance distortions get compounded by human resource competency and capacity constraints. A ministry is meant to formulate policy, set strategic direction, establish enabling frameworks, exercise impartial oversight, evenly regulate, and provide a level-playing field for private actors. Where policymaking is concerned, governments are not fungible. Policymaking and public interest are their core roles, but they must have capacity to take stock of the full range of responsibilities inherent to their mandate. Competency is crucial at the leadership level to comprehend this mandate. How is it then that the system often places a leader in a public agency without appropriate understanding of these stewardship roles? Imagine a company with a CEO who doesn’t know the job, one who doesn’t have goals to deliver on and one who is also not accountable. What simply never happens in the private sector is the norm in the public system. With policymakers unable to understand their mandate, functionaries tangled in tactical decision-making, information systems underutilised and pervasive perverse incentives, we set government up perfectly to fail. Compounding these performance distortions is another unrecognised factor. A popular misconception is that the government is one entity, which is not the case. The government (even at one level – federal or provincial) is an archipelago of many ministries, agencies and departments, with overlapping jurisdictions and/or competing interests. There is little incentive to work together, share resources and exploit synergy. Ironically, solutions to most public sector problems lie in intersectoral action. This creates a twofold imperative. On the one hand governments need new competencies to tap the potential within intersectoral collaboration – such as intermediary agencies. On the other hand, new instruments and incentives are needed which can enable asset allocation mapping and foster collaborative division of labour. It is within this frame that metrics for whole of government performance assessment should also be developed with clarity on the manner in which sectors contribute to overall performance. Unfortunately, the deepest governance reform to date, the 18th Amendment to the constitution was unable to address most of the causes of government’s underperformance despite the broad-based changes it introduced in the entire state system. Some urgently needed next steps are an imperative to enhance government performance. These should focus on institutionalising rule-based control on government functioning and rooting out politicisation and arbitrariness. Attention to merit and conflict of interest, greater transparency through electronic filing and documentation within government ministries, electronic public expenditure tracking and procurement, better oversight of discretionary powers and effective use of existing audit tools are critical entry points to reform in that regard. These initial steps standalone have inherent promise and can pave the way for tapping the country’s inherent strengths and unlocking the potential of its people. October 22, 2014: The Nossal Institute for Global Health, University of Melbourne’s 10th Annual Global Health Forum is underway today. The theme of the forum is “Health security and economic growth in Asia-Pacific – challenges for Australian aid?” The forum is being held at an opportune time since the Australian aid agency, AusAID has recently integrated with Australia’s Ministry of Foreign Affairs. 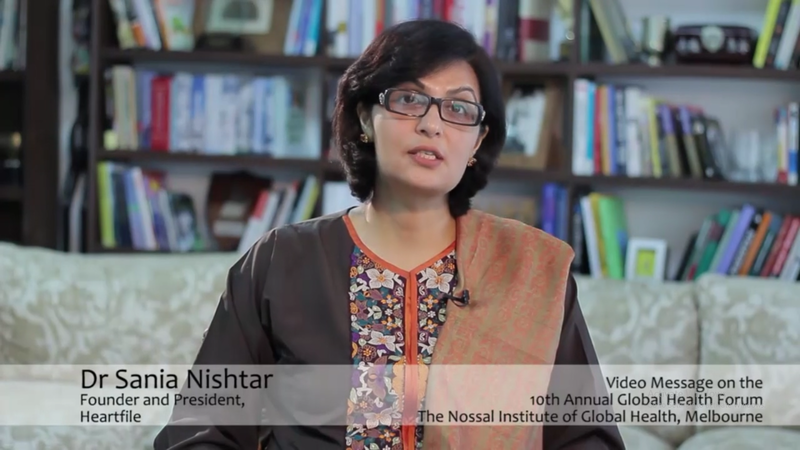 The event featured a special video presentation by our President, Sania Nishtar, who spoke about four strategic areas that need consideration in discussions on foreign assistance in a context where priorities are likely to shift post-2015, when the MDGs come to term and a new era for development partnerships, dawns. The video presentation can be viewed here. October 17, 2014: Pakistan Innovation Foundation’s first National Conference on Innovation was held on Oct 16th, 2014 at Serena Hotel in Islamabad. Pakistan Innovation Forum was a by-invitation-only conference, which brought together leaders from the industry, business, academic, and government sectors, as well as innovators and entrepreneurs. The foundation has recently floated a number of innovation challenges and is recognized as a reputed innovation-focused civil society agency in the country. 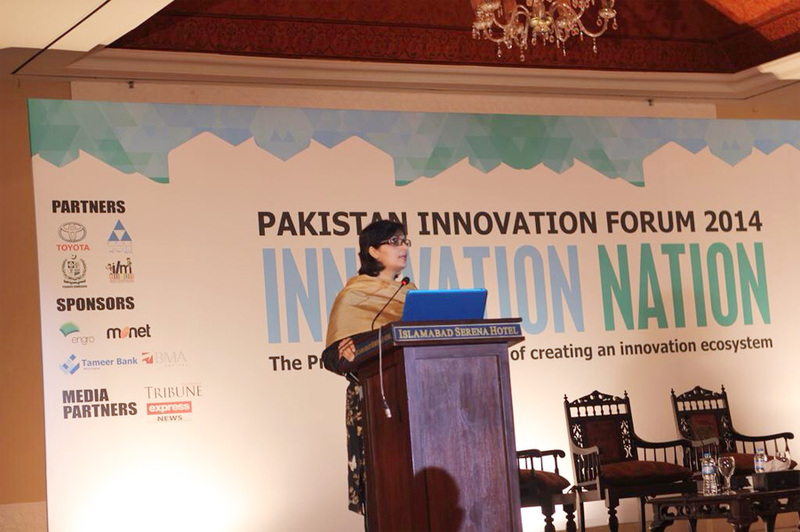 Our President, Sania Nishtar gave the keynote address at the conference and talked about the policy and institutional challenges of innovation, referring particularly to her insights as former Federal Minister of Science and Technology, the national stewardship agency responsible for S&T and innovation. 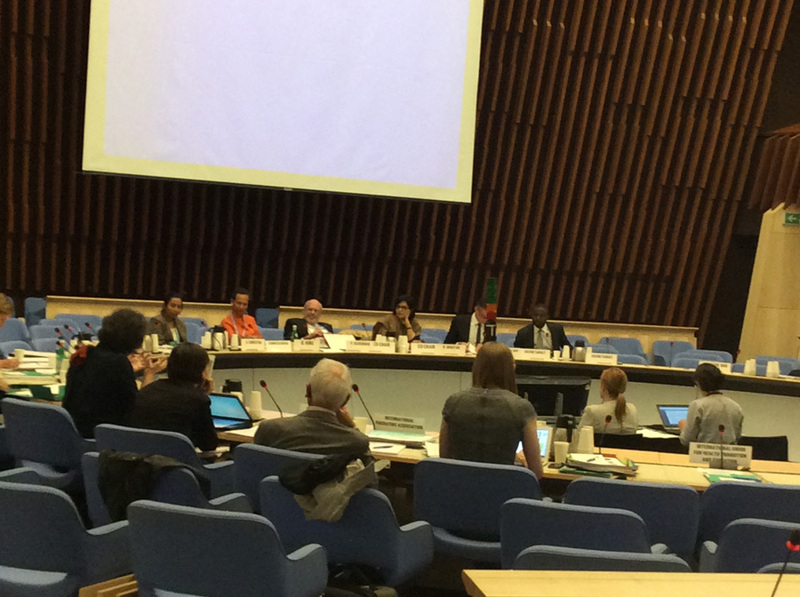 October 15, 2014: The World Health Organization’s Commission on Ending Childhood Obesity held its first set of hearings with the private sector and non-governmental organizations in Geneva on October 13 and 14. of Our President Sania Nishtar the Commission co-chair attended the meetings on both days. The hearings are part of the ECHO commission process. Details can be accessed at the World Health Organization website.